Lung cancer occurs when certain cells within the lung grow in an uncontrolled, abnormal, manner. There are two major categories of lung cancer—small cell lung cancer (SCLC) and non-small cell lung cancer (NSCLC). Lung cancer is the leading cause of cancer death in the United States. According to the American Cancer Society, more than 221,000 patients will be diagnosed with lung cancer and nearly 157,000 will die from the disease in 2011. Molecular imaging is playing an increasingly important role in the detection, diagnosis and treatment of NSCLC, which accounts for the majority of lung cancer cases. Treatment options for NSCLC include chemotherapy and radiation and if diagnosed early enough, surgery. Accurately identifying if the cancer has spread to other parts of the body is critical for determining treatment options for patients. In the future, scientists anticipate that molecular imaging procedures will be increasingly used to evaluate disease progression, assess treatment strategies and monitor treatment effects. 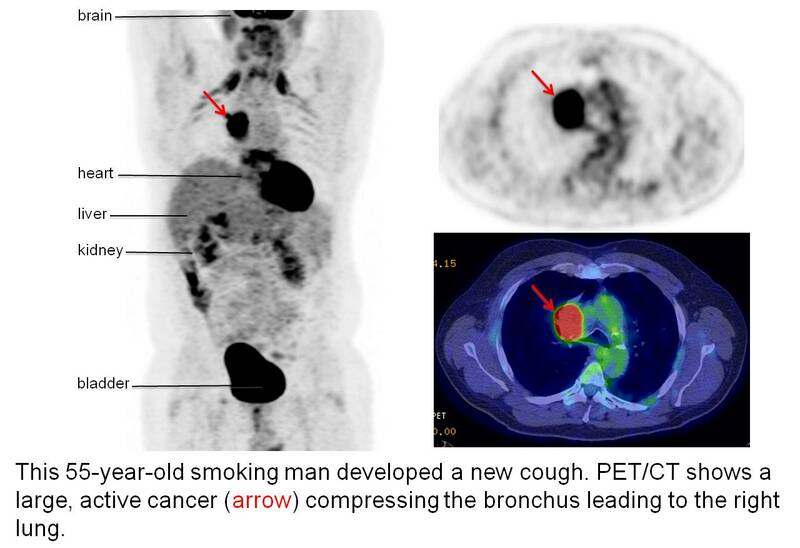 Technologies currently used to to diagnose and treat non-small cell lung cancer (NSCLC) include p_ositron emission tomography (PET) and combination PET and computed tomography (CT). PET involves the use of an imaging device (PET scanner) and a tiny amount of radiotracer that is injected into the patient’s bloodstream. A frequently used PET radiotracer is fluorodeoxyglucose (FDG), which the body treats like the simple sugar glucose. It usually takes between 30 and 60 minutes for the FDG distribution throughout the body to become fixed. A CT is also obtained on the same machine so the FDG and CT scans can be fused together and compared. ﻿How is PET used for lung cancer? Manage ongoing care: by early detection of the cancer coming back, including distinguishing the effects of radiation therapy from recurring disease. PET and PET-CT are the most accurate tools available for determining whether cancer treatments are destroying cancer cells, if cells are spreading to other parts of the body and whether cancer has recurred after surgery or other treatments. Because PET-CT imaging is highly accurate at determining whether non-small cell cancer has spread to the lymph nodes, it can provide a noninvasive alternative to a surgical procedure called mediastinoscopy. In this procedure, tissue is collected from the lymph nodes in the chest cavity and analyzed under a microscope to determine whether cancerous cells are present. If this type of biopsy is necessary, a surgeon may use PET-CT guidance to identify the lymph nodes mostly likely to contain cancer cells. Although lung tumors are often initially evaluated through a chest x-ray or CT scan, PET and PET-CT scans are highly accurate at determining whether a lung mass is cancerous and may even eliminate the need for surgical biopsy. Research indicates a correlation between the amount of FDG radiotracer absorbed by the cancer cells during a PET scan and the patient’s chances for survival. Patients whose lung cancer absorbs less FDG have a greater survival rate. detailed images provided by PET are able to accurately distinguish between benign and malignant tumors as small as one centimeter. Researchers are making exciting advances in understanding the molecular and genetic mechanisms that play a role in the development of lung cancer. Promising areas of research include the development of novel reporter-gene imaging systems, which involve engineering genes that are able to adhere to specific cells so they may be tracked with molecular imaging technologies. In addition, scientists are working on ways to image molecular markers and biological pathways that are able to provide insight into the progression of lung disease and its response to treatment. Fact Sheet: What is PET?